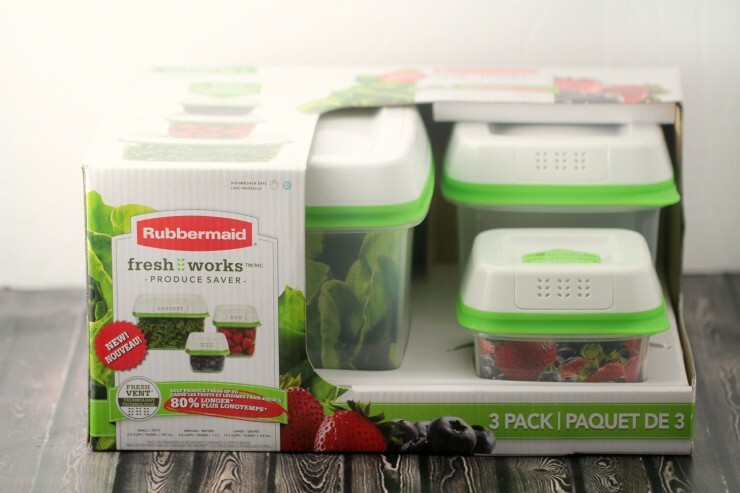 Keep Produce Fresh Longer with Rubbermaid FreshWorks Produce Savers - Frugal Mom Eh! This is a sponsored post written by me on behalf of Rubbermaid®. All opinions are 100% mine. One of my biggest frustrations is buying beautiful, fresh produce only to have it spoil on me just a few days later before I’ve had the chance to enjoy it. It happens more frequently than I like but I can now kiss those days goodbye thanks to Rubbermaid® FreshWorks™ Produce Savers. Rubbermaid® FreshWorks™ Produce Savers features technology that helps to keep food looking and tasting better for longer. This includes a unique venting system that regulates the flow of air in and out of the container, creating the perfect environment for fresh fruit and veggies. 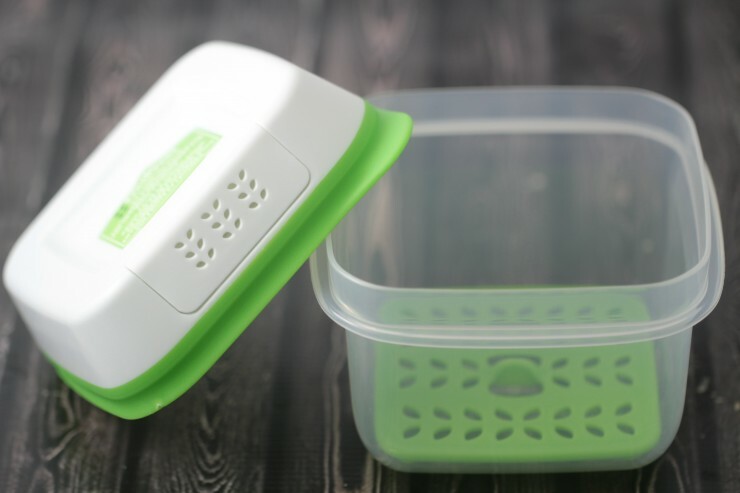 They also feature a little green tray that sits on the bottom of the containers that keep food away from moisture which helps prevent food going bad for longer. 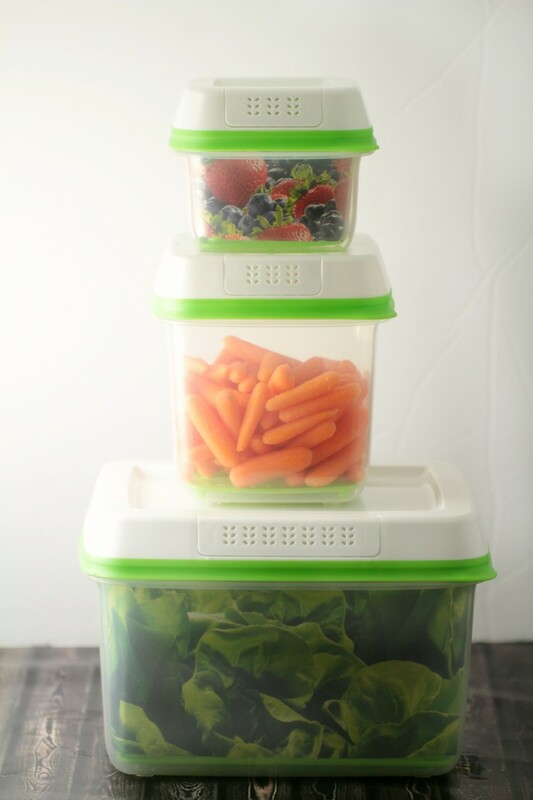 I have been testing out the Rubbermaid® FreshWorks™ containers for a couple weeks and really love how they have helped us cut down on waste thanks to our produce lasting longer. We love to eat fruit in our house but it is impossible to buy enough fresh fruit to last the week but now that the freshness lasts so much longer we can actually stock up for the week and save on grocery trips. I appreciate that the Rubbermaid® FreshWorks™ Produce Savers are all safe to throw in the dishwashers top-rack to clean and are BPA-Free. I’ve kept cut lettuce, baby carrots, cucumbers, sliced bell peppers, strawberries, blackberries, and raspberries in these containers with fantastic results. I have also found that they keep herbs very fresh and since we cook with a lot of fresh herbs it is nice to always have them on hand considering how fast they tend to go bad. I’m impressed with the results and I can definitely recommend this RRubbermaid® FreshWorks™ Produce Savers, especially for the storage of fragile berries. Rubbermaid® FreshWorks™ Savers will help make your fruits and veggies last longer and help to reduce food waste in your kitchen. Get a $3 coupon off Rubbermaid® FreshWorks™ Produce Savers and try them yourself, you won’t be dissapointed! Thanks for the review,I could sure use some of those!